Not surprisingly then, the news that’s coming out of Washington about tax reform demonstrates that the reforms we’re seeing are only shifting around the tax burden without actually lessening it. The central scam at the heart of the matter is that DC politicians are more or less devoted to “revenue neutral” tax reforms. That means if one group sees a tax cut, then another group will lose a deduction, or even see an actual increase in tax rates. [O]n the eve of the House Ways and Means committee vote on the tax bill—-which will then be barricaded by a no amendments “closed rule” when it goes to the full house—–the smoking gun is already apparent. By 2027 (after the temporary $300 adult tax credit gimmick expires and all provisions of the Brady mark become fully effective), the middle quintile US family ( about 30 million filers between $55,000 and $93,000 of AGI) would find itself in a crap shoot. That’s a whole lot of rolling dice—-depending upon family size, sources of income and previous use of itemized deductions. But here’s the thing: For the heart of the middle class as a whole—-30 million filers in the aforementioned income brackets—the statistical average tax cut would amount to $6.15 per week. That’s right. Two Starbucks cappuccinos and a banana! Even if you’re one of the lucky ones, you’re looking at a miniscule tax cut, thus demonstrating that the main point of the exercise has been to allow lobbyists and politicians to make deals involving special legislative favors in exchange for “campaign contributions” (i.e., bribes). Continued increases in spending drive more deficit spending, which leads to inflationary monetary policy and future taxes necessary to service the debt. Government spending itself imposes a burden on taxpayers as government programs distort the economy, create bubbles, and drive up prices. Even greater problems arise when — in order to increase demand for government debt, and thus reduce interest rates — the central bank begins to buy government debt. Over the past decade, in fact, the Fed has amassed a balance sheet of 4.5 trillion dollars, with much of that being government debt. Current claims that the Fed is now reducing this stockpile are half-truths at best since this “unwind” involves only tiny portions of the Fed’s portfolio. In order to purchase this huge portfolio, of course, the Fed has created trillions of dollars “out of thin air.” As this money has entered the economy, it has caused asset inflation — as we now see with real estate, stocks, and other assets. These high prices and low interest rates not only increase housing prices, but they starve middle-income investors of yields from traditionally conservative investments, thus driving them into riskier investments. Moreover, this inflationary policy robs consumers of beneficial deflation in consumer prices, keeping prices flat or slightly increasing, when they should have been decreasing. The second problem with government spending is the spending itself. Government spending is often treated as if it would be nothing but a good thing so long as the spending weren’t funded by taxes. The idea is that government spending leads to the creation and manufacture of any number of wonderful amenities such as roads, universities, and aircraft carriers. The only down side is the taxation. This, however, is not how it works. Government spending itself imposes a cost on society by replacing decentralized market-based transactions with government central planning. One recent example of this is the so-called “Amazon amendment” currently being considered in Washington. If passed, Amazon corporation would be awarded a massive government contract to oversee government procurement operations. This in effect would give Amazon an enormous advantage in the marketplace, stifling competition, and ultimately making Amazon less sensitive to market prices. After all, if the federal government becomes a key client of Amazon, ordinary customers become much less important. Contrary to Keynesians, the problem with government budget deficits is not merely that they (typically) lead to higher interest rates and thus reduce private-sector investment and consumption spending. Because, in this context, the Keynesians only look at economic factors insofar as they work through “aggregate demand,” they understandably think that large deficits can’t possibly hurt anything when interest rates are practically zero. However, Austrian economists have a much richer model of the capital structure of the economy. In this view, economic health isn’t simply a matter of propping up total spending high enough to keep everybody employed. On the contrary, resources need to be deployed in particular combinations in particular sectors of the economy, so that semifinished goods can be transformed step-by-step as they move through the hands of various workers at different businesses and finally onto retail shelves. If the GOP were really interested in cutting the real burden imposed by government, the GOP would be trying to cut spending. Or at least just freeze spending where it is. This doesn’t have to be some radical, pie-in-the-sky 20% cut across the board. It could just be a commitment to keep spending flat. That, of course, isn’t going to happen because the largest pieces of the federal budget: Social Security, Medicare, and military spending, are all locked up by powerful voting blocs and special interests who demand their taxpayer-funded checks every month. Thus, instead of any prudence on spending, we be getting the usual fraud which involves “tax reform” coupled with ever-increasing government spending. What moron wrote this? You are Democrats. 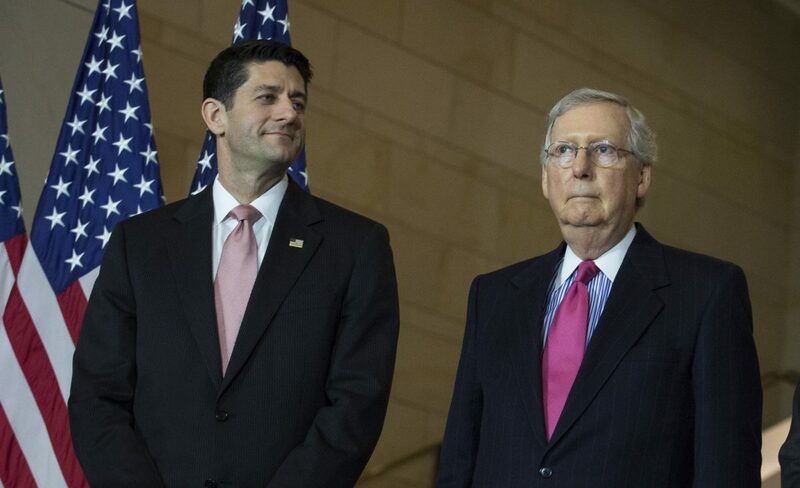 Why attack GOP leadership? Trying attacking Democrats you RINO TRAITORS. Your Trump derangement syndrome really needs to be treated, Ray. Seek professional help. Each comment of yours is more deranged than the last. That should be done in separate bills. Not what Trump asked for. Would never get tax reform if they combined the too. We must cut taxes and reduce spending. if they were held accountable like a bank teller it would be a lot different. All those wonderful tax reform speeches and NOT one mention of the Obamacare Tax? Couldn’t watch him last night, I just didn’t believe anything he said and AGREE 100% CUT THE DAMN SPENDING! If they don’t looking to Democrats is a sane course? Why should they? I will believe “conservatives” when they cease to fall for the “national security” fraud and start cutting the military/IA budgets.